It was in the mid-sixties, in the musical hotbed that was Hamburg, that 'Ikarus' were formed. Ikarus were just the latest beat group that had been formed in Hamburg. By 1966, 'Ikarus' made tentative steps onto Hamburg’s live scene. 'Ikarus’' earliest concerts took place in youth clubs, where they played cover versions of popular song. At first,'Ikarus' were called 'Beautique In Corporation'. Soon, this was soon shortened to 'BIC'. This found favour among the band’s audience. Although a relatively new group, 'BIC' quickly won over audiences. Soon, they had large and enthusiastic audience. 'BIC' played what they wanted to hear. They weren’t above playing covers of hits by Elvis Presley and Tom Jones. This was easy on the ear of the audience. However, before long, 'BIC’s' setlist changed. The band members began to write their own songs. Audiences expected to hear original material. They didn’t just want to hear cover versions. This suited the members of 'BIC', who were classically trained musicians. Composition came easy to them. These new songs were added to 'BIC’s' sets. Some of these songs had a psychedelic sound. 'BIC’s' music was evolving, as music evolved. This proved popular when 'BIC' played live. By then, 'BIC' had graduated from the youth club circuit, and were by now familiar faces on the Hamburg and North German music scene. Their music was a mixture of psychedelia and rock. However, there was an element of comedy in 'BIC’s' sets. Soon, 'BIC' were one of the most successful Hamburg bands. They were well on their way to becoming one of the leading lights of the Hamburg scene. So when they saw an advert for the 1969 Hamburg student beat band competition, 'BIC' decided to enter. Having won the 1969 Hamburg student beat band competition, 'BIC' were invited to in the 1970 Hamburg 'Pop and Blues festival'. It took place between the 1st and 3rd of April 1970. 'BIC' were going to rub shoulders with some of the biggest band on that early seventies. Among them, were 'Chicken Shack', 'Steampacket', 'Alexis Corner' and 'Hardin and York'. Despite such an illustrious lineup, it was the hometown band that won the hearts and minds of the audience. 'BIC' had stolen the show. After their performance at the 1970 Hamburg 'Pop and Blues festival', things happened quickly for 'BIC'. A live album of 'BIC’s' performance at the Hamburg Pop and Blues festival was released as their debut album. It was augmented by performances from 'Frumpy' and 'Tomorrow’s Gift'. The album sold fairly well, and it looked like 'BIC’s' star was in the ascendancy. Just a few months later, 'BIC’s' lineup changed, when two new names joined the band. Now 'BIC' was a five piece band. The new lineup of 'BIC' was then asked to open for British band 'Uriah Heep' on their forthcoming tour. This was the start of the rise and rise of 'BIC'. Not long after this, 'BIC' acquired a manager, who was also a concert promoter, Will Jahncke. One of his first suggestions was that 'BIC' changed their name to 'Ikarus'. While this seemed more in keeping with the psychedelic and progressive rock scene, 'BIC' were a popular and successful band. However, the five members decided to change the band’s name to 'Ikarus'. Following the name change, 'Ikarus’' music changed. They were inspired to do so, by 'King Crimson', 'Yes', 'Colosseum' and 'Frank Zappa'. Soon, 'Ikarus' were fusing fusion with progressive rock and experimental music. There was still a slight psychedelic sound to their music. However, the new sound didn’t please everyone. 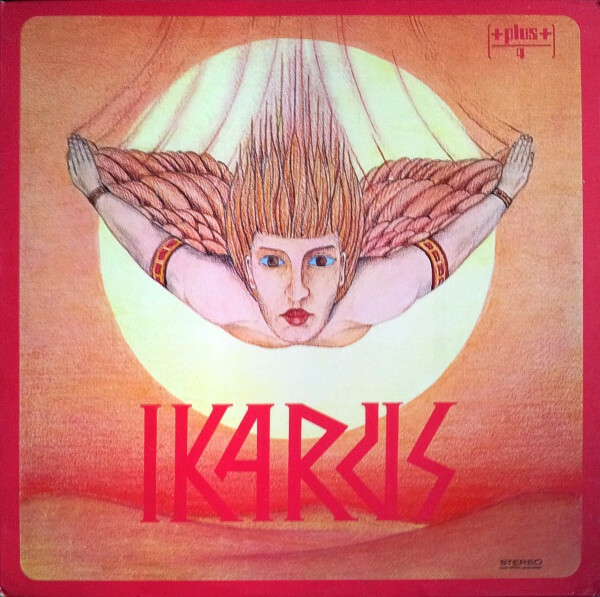 With the critics championing their music, it made sense for 'Ikarus' to record their debut album in the second half of 1971. So the five members of 'Ikarus' made their way to the Windrose Studio, Hamburg. By then, the members of 'Ikarus' had written four songs. Each of the songs were collaborations between members of the band. That was apart from The Raven Including “Theme For James Marshall.” It was an 'Edgar Allan Poe' poem set to music written by four members of 'Ikarus'. This became a near twelve minute epic that featured on side two of 'Ikarus'. With the album written, the band began recording their debut album. The album sold well, and soon, the band were playing sellout shows across Germany. In Hamburg, 'Ikarus’' home town, they were asked open for 'Deep Purple'. It looked like 'Ikarus' were were well on their way to becoming one of the stars of the German music scene. Those that heard Ikarus concurred. Sadly, 'Ikarus' was the only album that the band ever released. The 'Ikarus’' story is a case of unfilled potential.